If we’re going to prepare future generations for the increasingly technical workforce, and world, then computer science and engineering will need to be given greater credence in early education — both in and outside of the classroom. While that may sound like a given to some readers, the fact is that the U.S. education system is struggling to get young people excited about and engaging in STEM-related fields, particularly in computer science, a subject that has actually seen a decline in participation over the past 20 years. To reverse this trend, interest in computer science and technology has to be inspired early. Of course, learning the rules of computer science (and learning to code) is no easy thing for adults, let alone for young’uns. Vikas Gupta, Saurabh Gupta and Mikal Graves founded Play-i in 2012 to tackle this problem and make computer science and engineering concepts more accessible to wee ones in the most kid-friendly form they could think of: Robots. 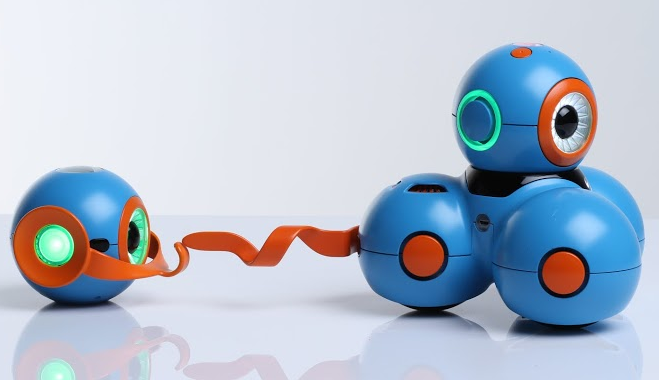 The co-founders, who have years of design and engineering experience at Google, Apple and Frog Design between them, created Bo and Yana, two educational, interactive robots that kids can use to learn the basics of programming — and more importantly, play with as if they’re toys. When the robots begin shipping later this year, kids will be able to play with Bo and Yana right out of the box, controlling them through the startup’s companion apps designed for tablets and mobile devices. After raising $1 million from Google Ventures, Madrona Venture Group and others last year to build the prototypes, the team launched a crowdfunding campaign in November to test consumer demand for Bo and Yana. They found plenty, raising $1.4 million from the crowd over their 31-day campaign, five-times their original goal, with contributions coming from dozens of countries and 30 percent of the total originating from outside the U.S.
As the team works to fill the 11,000-plus pre-orders received to date and solidify the manufacturing and distribution partnerships that could bring its toy robots to retail stores and eCommerce outlets near you by the end of 2014, Play-i is adding more coin to its coffers. The company announced today that it has closed $8 million of Series A financing in a round led by Madrona Venture Group and Charles River Ventures. All told, the company has raised just over $10 million to date. With its new funding under its belt, Play-i co-founder and former head of consumer payments at Google, Vikas Gupta tells us that the startups will be looking to double its team of 15 over the next year, focusing in particular on recruiting engineering talent. This comes in tandem with the announcement that Play-i has struck a partnership with over 100 developers for early access to its new API. While developers can apply for early access to its API now, Play-i plans a broad release of its API for public use when it begins shipping Bo and Yana later this year. While Bo and Yana were created as supplementary, early learning tools with at-home use in mind, the Play-i founder tells TechCrunch that the company is finding that demand is high in schools as well. Over 200 schools have signed up to use Bo and Yana to teach programming in their fledgling, evolving curricula, Gupta says, and the company is currently working with a handful of them to run pilot programs. Since running its crowdfunding campaign late last year, the Play-i team has been focused on improving the software side of its robot-tablet educational tandem, particularly on making the interface more engaging and fun for kids. For those unfamiliar, kids can control the robots through Play-i’s mobile apps, which present visual sequences of commands and simple actions that kids perform to incite movement and action from Bo and Yana. The app introduces kids to a series of introductory games that get them learning the basic tenets of programming, including subroutines, functions and loops. The app might prompt kids to play four blue notes and six pink notes on a xylophone using Bo’s robotic arm, programming the robot to hammer four times on blue, pivot along the line by a few spaces and hammer six times on pink, for example. Beyond creating a tune on the xylophone, young’uns can also prompt the three-wheeled Bo to scoot around the room or blink his light, while Yana can be programmed to interact with Bo in play or, say, roar like a lion. The idea, Gupta tells us, is to get kids learning the rudiments of programming, like causation, through a simple programming language, actionable storytelling, music and play. Play-i wants Bo and Yana to be accessible to a range of ages — beyond just the 5 to 8 group — and is building interfaces for Bo and Yana for the former, for 8 to 12 and for over 12 as well. The idea is to make the level of learning as challenging or as simple as the user needs it to be. As such, commands are recorded in a range of programming languages, including Java and Python, so that learning (and commands) have the potential to become more complex as kids progress. The truth is that the gamification of programming education (particularly through toys) isn’t new. As Eliza pointed out early on, Play-i joins a market alongside existing products and companies like Move the Turtle, Bee-Bot and Move The Turtle, to name a few. Of course, the robots-as-toys method of teaching basic computer science concepts is still young, and it’s likely that the market itself (as well as demand) is just beginning to get off its feet. Reform is pushing STEM-focused education into an increasing number of schools, and as this transformation accelerates, teachers will be looking to find simple, engaging tools that help introduce and demonstrate these concepts to younger and younger crowds. So, as John said in January, while it’s easy to be skeptical of techie toys (as they so often lose their luster fast and end up in the junk box), Play-is robots have come a long way in a short period of time and have a lot of promise. After all, it does seem as if the demand, and the opportunity, for these kinds of engaging, educational toys will only continue to grow.